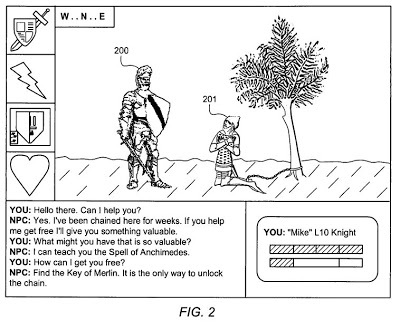 The ‘806 patent provides a system where NPC (non-playing characters) can be programmed with different “goals’ during an MMOG game. A user can have his avatar approach a NPC and interact with him. Under this invention, the NPC will have a different interaction with the player each time depending on the internal time and past decisions the player has made. For example, at one point the NPC may need the player’s help setting a trap for a bear, when the next time he needs help with his campaign for mayor. By programming several options into the NPC, the invention attempts to make sure that the user’s past choices in the game matter and affect the game play. The invention provides a role-playing game environment wherein the nature of various NPCs within the game may be varied over time within the game. The goals of various NPCs within the game may be dynamically and automatically changed within the game. At certain in-game time periods, the game server may dynamically assign one or more new goals for some or all of the NPCs based on the current status of each NPC. When a player later interacts with a given NPC assist (or impede) that NPC in reaching its currently assigned goal, the method may dynamically determine a steps that the player’s avatar may perform to assist (or impede) the goal. Thus, players cannot predict what will happen when they move through the game and reach a location at which they can interact with a given NPC, making the game-playing experience ever fresh and challenging. 1. A method for varying the experiential content available to human players of an only role-playing game comprising: a computer providing an in-game environment having a number of computer-generated, computer-controlled, non-playing characters (NPCs) with which human players can interact, wherein human players carry a status with in the in-game environment based on their prior game-playing experience, and wherein the in-game status of a given human player is stored so as to be carried forward from one game-playing session to the next; the computer assigning an individual set of values to at least some of the NPCs, wherein the set of values assigned to an y such NPC is stored so as to be carried forward from one game-playing session to the next; the computer providing a set of goals which are available to be assigned to the NPCs with in the in-game environment, wherein for each goal of the set of goals, the computer provides a set of candidate steps which, if accomplished during in-game play, will result in achieving the goal; within an in-game time frame defined by the computer for use within the in-game environment, the computer assigning a specific goal randomly selected from at least a subset of the set of goals to one of the NPCs, wherein the specific goal remains assigned to the one of the NPCs for at least the duration of the in-game time frame; within the in-game time frame, in response to a human player electing to interact with one of the NPCs, the computer defining a set of one or more steps operable by the human player during the in-game time frame to assist the one of the NPCs in achieving the specific goal from among the set of candidate steps for the specific goal; and within a subsequent in-game time frame, the computer assigning a different goal randomly selected from a subset of the set of goals other than the at least a subset of the set of goals to the one of the NPCs for at least the duration of the subsequent in-game time frame.